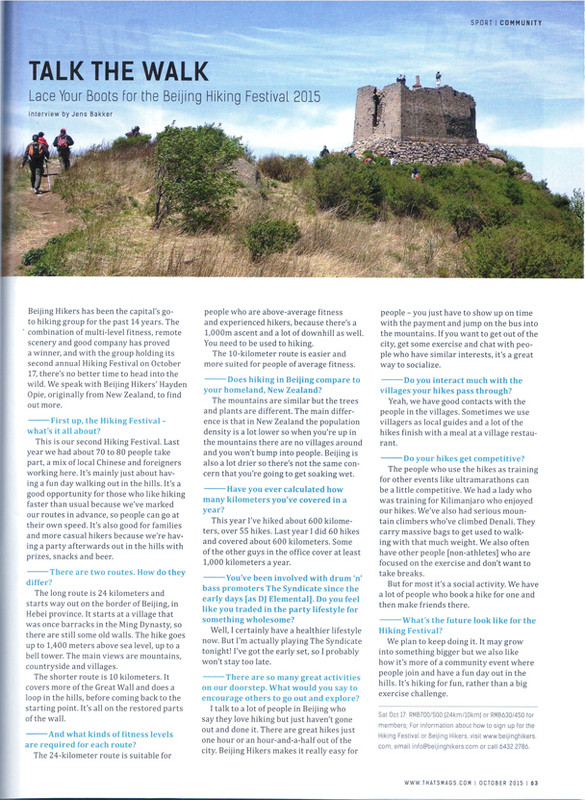 In Brief: An interview by That’s Beijing magazine conducted ahead of our hiking festival. 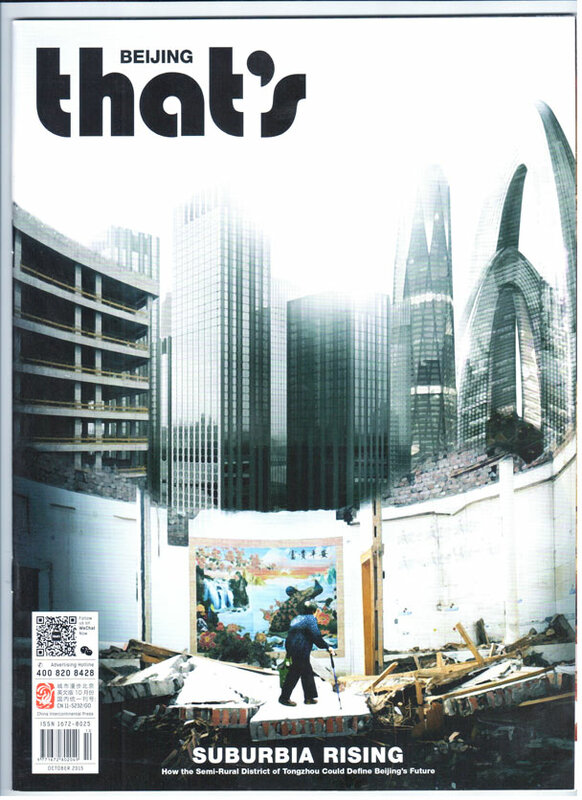 That's Beijing magazine interviewed us ahead of our hiking festival, and our chat covered the festival and a few other assorted topics. Also click here to check out their selection of photos from the festival. Here's a copy of the text of the article. Beijing Hikers has been the capital’s go-to hiking group for the past 14 years. The combination of multi-level fitness, remote scenery and good company has proved a winner, and with the group holding its second annual Hiking Festival on October 17, there’s no better time to head into the wild. We speak with Beijing Hikers’ Hayden Opie, originally from New Zealand, to find out more. — First up, the Hiking Festival – what’s it all about? This is our second Hiking Festival. Last year we had about 70 to 80 people take part, a mix of local Chinese and foreigners working here. It’s mainly just about having a fun day walking out in the hills. It’s a good opportunity for those who like hiking faster than usual because we’ve marked our routes in advance, so people can go at their own speed. It’s also good for families and more casual hikers because we’re having a party afterwards out in the hills with prizes, snacks and beer. — There are two routes. How do they differ? The long route is 24 kilometers and starts way out on the border of Beijing, in Hebei province. It starts at a village that was once a barracks in the Ming Dynasty, so there are still some old walls. The hike goes up to 1,400 meters above sea level, up to a bell tower. The main views are mountains, countryside and villages. The shorter route is 10 kilometers. It covers more of the Great Wall and does a loop in the hills, before coming back to the starting point. It’s all on the restored parts of the wall. — And what kinds of fitness levels are required for each route? The 24-kilometer route is suitable for people who are above-average fitness and experienced hikers, because there’s a 1,000m ascent and a lot of downhill as well. You need to be used to hiking. The 10-kilometer route is easier and more suited for people of average fitness. — Does hiking in Beijing compare to your homeland, New Zealand? The mountains are similar but the trees and plants are different. The main difference is that in New Zealand the population density is a lot lower so when you’re up in the mountains there are no villages around and you won’t bump into people. Beijing is also a lot drier so there’s not the same concern that you’re going to get soaking wet. — Have you ever calculated how many kilometers you’ve covered in a year? This year I’ve hiked about 600 kilometers, over 55 hikes. Last year I did 60 hikes and covered about 600 kilometers. Some of the other guys in the office cover at least 1,000 kilometers a year. — You’ve been involved with drum ‘n’ bass promoters The Syndicate since the early days [as DJ Elemental]. Do you feel like you traded in the party lifestyle for something wholesome? Well, I certainly have a healthier lifestyle now. But I’m actually playing The Syndicate tonight! I’ve got the early set, so I probably won’t stay too late. — There are so many great activities on our doorstep. What would you say to encourage others to go out and explore? I talk to a lot of people in Beijing who say they love hiking but just haven’t gone out and done it. There are great hikes just one hour or an hour-and-a-half out of the city. Beijing Hikers makes it really easy for people – you just have to show up on time with the payment and jump on the bus into the mountains. If you want to get out of the city, get some exercise and chat with people who have similar interests, it’s a great way to socialize. — Do you interact much with the villages your hikes pass through? Yeah, we have good contacts with the people in the villages. Sometimes we use villagers as local guides and a lot of the hikes finish with a meal at a village restaurant. — Do your hikes get competitive? The people who use the hikes as training for other events like ultramarathons can be a little competitive. We had a lady who was training for Kilimanjaro who enjoyed our hikes. We’ve also had serious mountain climbers who’ve climbed Denali. They carry massive bags to get used to walking with that much weight. We also often have other people [non-athletes] who are focused on the exercise and don’t want to take breaks. But for most it’s a social activity. We have a lot of people who book a hike for one and then make friends there. — What’s the future look like for the Hiking Festival? We plan to keep doing it. It may grow into something bigger but we also like how it’s more of a community event where people join and have a fun day out in the hills. It’s hiking for fun, rather than a big exercise challenge. Now you've read all that, a few minor corrections!